Data gloves are a part of many virtual reality systems for both healthy users and patients. Currently available data gloves suffer from two major disadvantages: their limited adjustability for different hand sizes and their unsuitability for use with patients suffering from hand paralysis or spasticity. For a clinic, the inability to adjust data gloves increases costs as it requires multiple sets to be kept on hand even if not all are in continuous use. If the clinic deals with hand motor rehabilitation, e.g. after cerebral or spinal cord injury, normal gloves can be difficult or impossible for patients to put on or remove due to swollen or cramped hands, even with assistance from therapists. 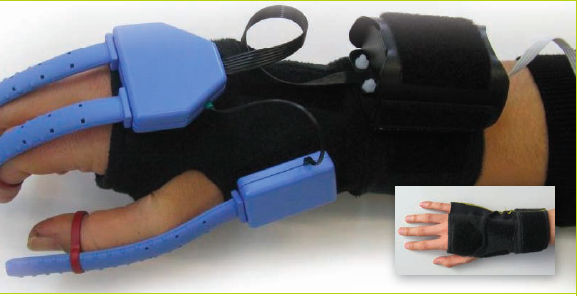 We have developed the SpiderGlove (Figure 1) to address the need for low-cost, highly adjustable gloves that are easy to handle for patients and therapists. 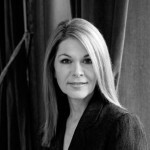 Its modular design separates the most costly part of the device – the electronics – from the underlying fabric. To put on the Spider- Glove, the user (patient or therapist) first selects one of the fabric units. These are made of a mix of fleece and Lycra, combining flexibility and comfort with a firm hold. They are available in four different sizes, covering the range from children of about 8 years to large male adults. The machinewashable fabric unit is designed as an elastic tube through which the user inserts his/her hand, with a single hole for the thumb. There are no separate finger holes, allowing the tube to be put on quickly and easily. The electronics, consisting of bend sensors and a wrist unit with accelerometers and digital compass, are then attached to the fabric units. One bend sensor each is used for the thumb, index and middle fingers. Only three digits are used to balance cost and usability against fidelity of finger tracking – approximately 70% of human grasping function is achieved using these fingers alone. Velcro is used to attach the electronics, allowing for precise adjustment for each patient. Finally, finger rings (available in three sizes) are attached to each bend sensor. The wrist unit on each hand is attached via a flexible cable to a small base unit which is connected to the host PC via a USB cable providing both data and power. In addition, vibration feedback is available in the box connecting the bend sensors between the index and middle fingers. Figure 1. Overview of the SpiderGlove. Bottom right: fabric unit. Main: Electronics attached with velcro and finger rings. With its high adjustability, the question of glove sensor calibration arises for Spider- Glove users with different hand sizes. We conducted an experiment with fifteen healthy volunteers, with hand sizes ranging from children (8 years old) to large adults. Each subject grasped a series of objects of different sizes and the bend sensor values were recorded. Surprisingly, the recorded sensor values were virtually the same independent of hand size (Figure 2). The resolution achieved was approximately 1.5 bend sensor units per mm of diameter for a cylindrical power grip and 0.6 units/mm for a precision pinch grip. 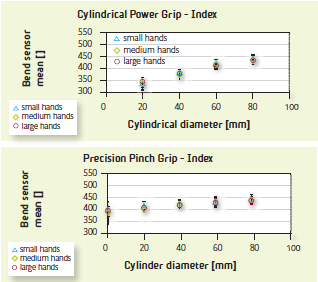 These results mean that not only can the SpiderGlove be physically fitted to a wide range of hand sizes, but that little or no recalibration should be necessary when transferring between users with different hand sizes. size. Top: power grip. Bottom: precision pinch grip. We have tested the SpiderGlove on over thirty acute and chronic stroke patients, ten children and dozens more healthy volunteers of all ages and sizes. In all cases the gloves have been easily fitted in less than one minute. Individual patients have worked with the gloves continuously for an hour at a time over a month, performing over 300 reach-and grasp actions during each session with no-discomfort issues. The SpiderGlove will shortly be made available for use in research and other applications. Future work will focus on obtaining more detailed hand pose information and automated decoding of grip type.